How Much is a Hotel Room in Rheinau? Hotels in Rheinau start at $109 per night. Prices and availability subject to change. Additional terms may apply. Planning to spend time in Zurich? 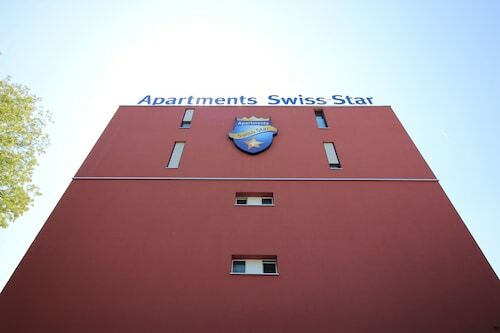 Need to arrange accommodation in the Rheinau area? Downtown Rheinau offers 9 suitable apartments and hotels within a 6-mile (10-kilometer) distance. Accommodation options that can be found within driving distance of Rheinau include the Best Western Plus Hotel Bahnhof and Sorell Hotel Rüden. The Widder Hotel can be found 18 miles (29 kilometers) from the downtown precinct of Rheinau. Also, the Park Hyatt Zurich can be found 18 miles (30 kilometers) away. 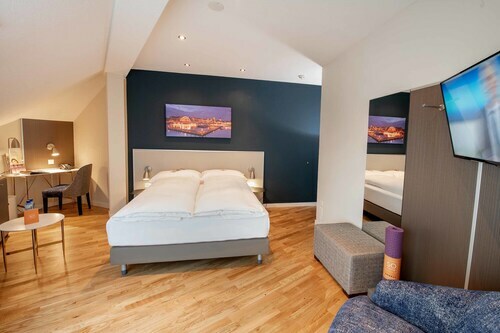 The The Dolder Grand and also the ALDEN Luxury Suite Hotel are alternative accommodation options in Rheinau. Following your exploration in Rheinau, be sure to visit Northern Switzerland's other great offerings. Northern Switzerland is known for rivers, lakes and mountains, and other popular visitor destinations are ruins. Popular activities in this particular part of Switzerland include skiing, mountain biking and cycling. 19 miles (31 kilometers) away from Rheinau, you will find Riesbach, which is where you can enjoy Botanical Garden and Johann Jacobs Museum. A few Riesbach lodgings include the Storchen Zurich and Eden au Lac. 19 miles (30 kilometers) south of Rheinau, you may also choose to stay at Zurich West, which is home to the Hotel Schweizerhof Zürich and Glockenhof Zürich. When you stay in Zurich West, be sure to venture to the Belvoir Park and Museum Rietberg. If sport is on your list of things to do in Rheinau, don't forget to visit AFG Arena, which is 35 miles (57 kilometers) to the southeast of Rheinau. Those that need to stay close to the stadium can choose from the Hotel Säntispark or the Sporting Hotel. 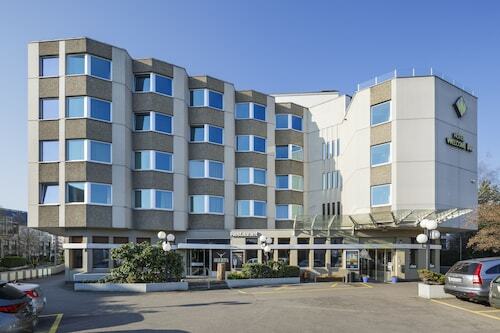 For travelers planning on arriving or departing via Zurich Airport, you may find it convenient to book some accommodation at Radisson Blu Hotel Zurich Airport, or Swissotel Zurich, which are both a short distance away. This is an excellent hotel in so many ways. The rooms are well-appointed and spacious. 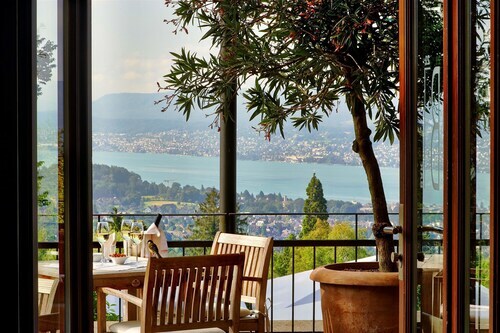 Views of the lake and the Alps beyond are gorgeous and a lake-view room is worth it. The service is friendly. Finally, I cannot say enough about the incredible breakfast that comes with your room - amazing. Let me start with positive note. The staff is friendly and helpful. The front staff is able to help with anything from tours, necessities or directions. The facility is outdated but the lounge has been upgraded and it's clean and safe. I travel solo and I always stay in Hilton. Unfortunately, I was disappointed with room service. This is the first Hilton that will not provide a wash towel. I was told by one of the staff they only give wash towel to suite hotel rooms. The staff will not replace glasses, cups or ice bag unless I ask. They even forgot to give me a hand soap. You think the staff will take care of you if you give them a tip everyday. Stopped tipping after 2 days. Hotel information is misleading. It is not located by the airport. It is about 10 minute drive from the airport. Shuttle to hotel is free but not to the airport. The charge is 5 francs if you need a shuttle to the airport. The train station is within walking distance but ended up going to the airport train station as most of the destination is by the airport. The breakfast was amazing. The rooms and elevator were a little small, but everything overall, immaculately clean. 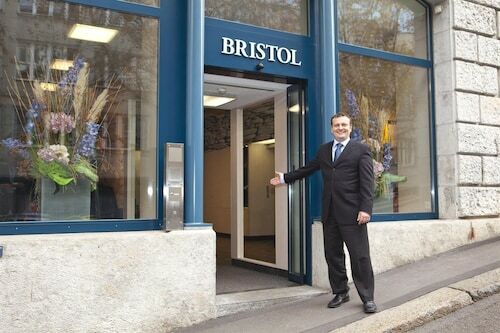 The location was good, nice and quiet and only 12 minute walk to city center. Also, tram stops right in front of the hotel if you don't like to walk. Nice clean hotel with wonderful staff. Right from the people in the reception to the staff in the restaurant everyone was wonderful and very attentive. Did their best to make us comfortable. The tram station was right outside the hotel and was extremely easy to go to the city center. Thanks to everyone at the hotel it felt like home for 10 days. We enjoyed our comfortable stay. The restaurant was excellent.